UME is a women-led design practice consisting of thoughtful listeners, thinkers, and designers working to amplify the feminine perspective and standing with female-led companies, female entrepreneurs, and future leaders – girls from all over the world. 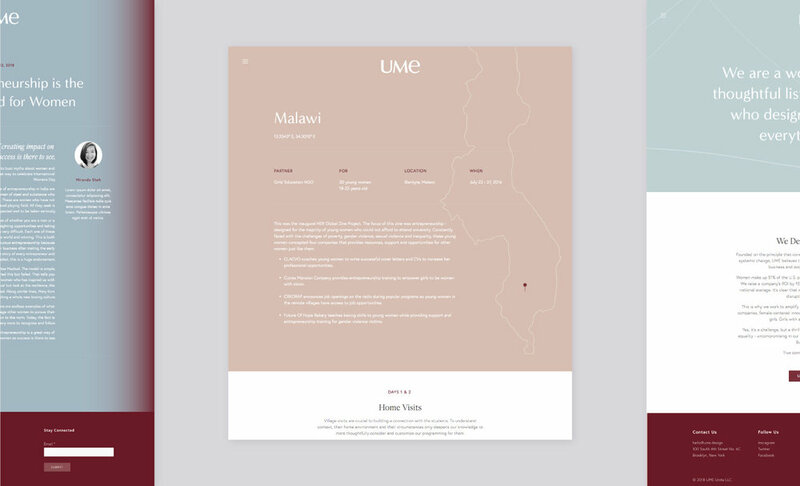 At its core, UME designs connections, and believes that true connection begins with You + Me. I worked closely with the team at UME to redesign their new website and rebrand select collateral. Early in our process I identified strength, femininity, and connection as important touchpoints to infuse into the work. From there, the challenge was bringing these three concepts together to create a holistic brand identity that could be translated across various channels. Ever evolving and always in motion. Drawing inspiration from fingerprints (individuality), topographic maps (global connection), and women right’s movements in the 60’s and 70’s, these elements merge to create a strong and ownable hero graphic. Even when static, the graphic feels as though it’s in constant motion because, as women, we’re always evolving. The gradating color palette, from mauve to cream, transitions into a hint of blue alluding to growth and things to come. By combining each style of line, a unique graphic emerges. This graphic represents the culmination of UME’s three components, representing UME as a whole. Using a modified ‘About’ graphic (the combination of lines from each UME component) the backs of UME’s business cards always connect through the lines when placed side-by-side. This symbolizes the different points of connection we all share. We may not connect on every level, but we’ll inevitably connect on at least one. 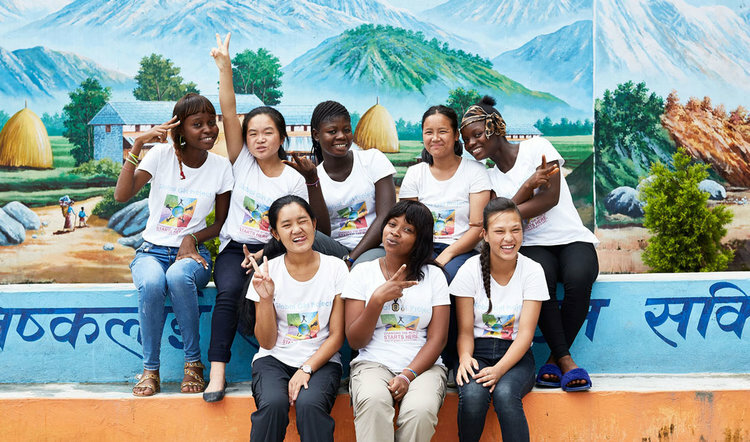 One component of UME’s mission is to work with young women in developing countries to help empower them to be strong leaders in their local communities. I was fortunate enough to join UME and The Global Girl Project on the ground in Kathmandu, Nepal to work with this group of amazing young women for HER 2018. Each girl has a mission she feels passionately about; topics ranged from helping street dogs to ending teenage pregnancy and early marriage, to allowing girls to get an education in their community. Over the course of 10 days, we worked with the group to develop their individual brand’s mission and identity. We assisted as each girl built out their brand through collage and created their own logo, which we then digitized together. The end result: a zine celebrating each girl as an individual and a leader. Learn more about HER Global Zine Project here.